These cheerful, oversized Easter gift baskets are just blooming with a delectable variety of gourmet snacks and savory sweets and several fun and festive Easter gifts! Three boxes of the classic marshmallow treat "Peeps"
This large basket is a surefire way to grow smiles on the faces of your loved ones. It’s a very festive and fun gift featuring three cheerful plush smiling flowers with stems that wrap around and grip on to things. How great would these look in a kid’s bedroom?! 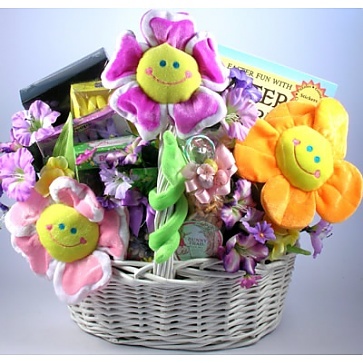 Blooming with silk flowers and topped with a large designer bow this gift basket will certainly brighten their day!